We don’t tell ourselves that we love us enough. We go through our day constantly criticizing and monitoring our behaviors and thoughts, but we often forget to give ourselves a hug, cut ourselves a break, or simply look in the mirror and say, “I love you”. Even though I am on a mission to spread love to everyone in my life, I often forget to take the time and show myself this kind of love. I too, fall victim to the self-criticism and scrutiny… BUT I found something simple that helps. Last March, Tim and I watched a documentary titled “Hungry for Change” while it was premiering as a free stream online. My inner sparkle gleamed bright when I heard Dr. Christiane Northrup describe a wonderful technique; she suggested that everyone should hang a little sign on the bathroom mirror as a reminder to love themself. 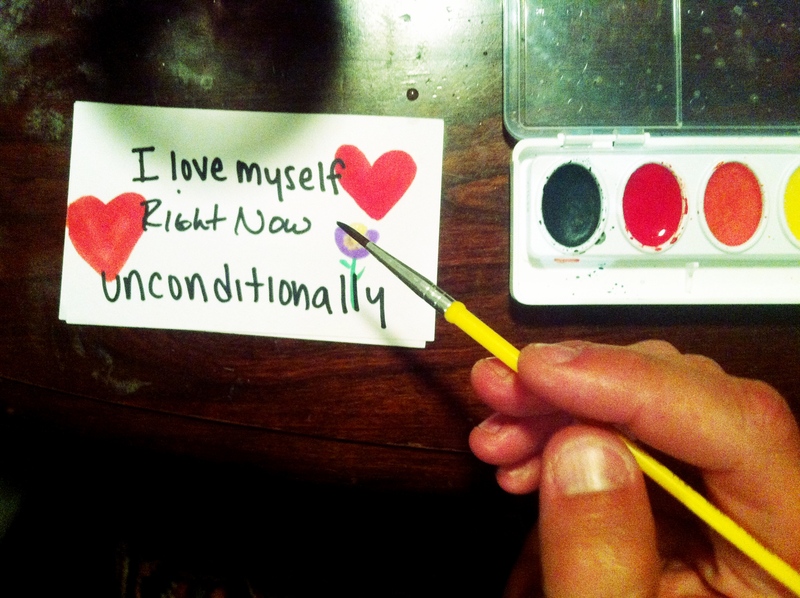 So, I took her advice, and hung on our bathroom mirror a sign that reads ‘I love myself, right now, unconditionally’. This was the first step. Feel free to decorate your sign however you wish. Tim and I agreed that from then on we would follow her advice and spend 30 seconds each day in front of the mirror, reading these words, and then just being with ourselves. Breathing, quieting our thoughts, reciting these perfect words, and just being present. For the first week, it was an uncomfortable 30 seconds; I spent most of that time trying to quiet that nasty lady who lives rent-free in my head telling me “you don’t really love yourself, what’s to love?” But over time her voice has softened, and some days, I don’t hear her at all. It’s an intimate 30 seconds that I have begun to look forward too. I look at myself in the mirror and really try to admire my thoughts, I am learning to love the wrinkles that have made me the person that I am, I think about the beauty that I am trying to bring to this world, and repeatedly tell myself “I love you”. And the rest of the day? Whenever I make trips into the bathroom, that sweet little sign is a reminder to lighten up on myself, give myself a hug, and love the space that I am in. Dedicate just 30 seconds everyday to stand in front of the mirror alone, say these words like you were talking to a small child, and then just be. Enjoy your face, your thoughts, your purpose, and don’t cut yourself short. Remember, you deserve to be loved. Tags: affirmation, love, loving, self. Bookmark the permalink.